10 days of cruelty-free favorites: Day 3 – Beauty, for good. Today’s fave is one that I have been reaching for pretty much every day I’ve worn makeup since the lovely Snowpacalypse hit New England in January. I needed something that would hydrate my superficially dry, but also oil-prone skin, while also helping to even out my skin tone. 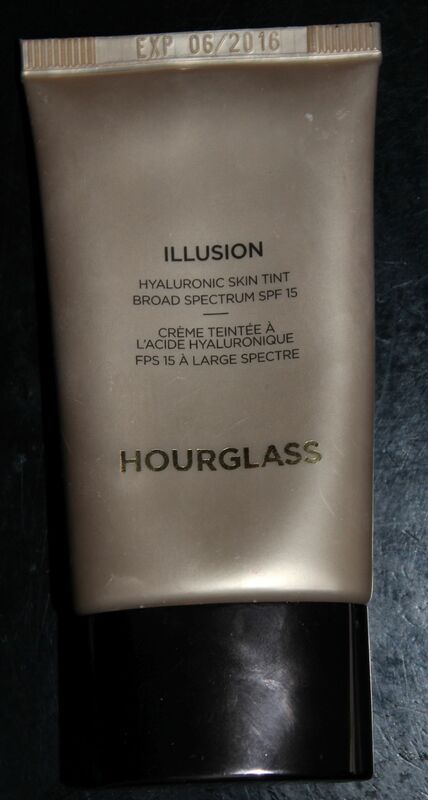 To the rescue, Hourglass Illusion Hyaluronic Skin Tint. I’m a pretty big Hourglass-fan in general, and this formula has been my winter skin savior. Hydrating, but not heavy, with good staying power. Natural-looking, but well-pigmented enough to even out my skin-tone. For proof, just check out the before-and-after photo below. My shade is Shell, and I find Hourglass base products to be quite consistent in that Shell is my shade no matter which formulation I’m using. do) and I’ve used it so much, I’m betting it will show up in my next Empties post. Oh, and stayed tuned for tomorrow’s favorite, which will feature my fave way to apply this creamy wonder…. Pingback: Favorite Cruelty-free Foundations for Summer: Part 2 medium coverage | Beauty, for good. Pingback: Cruelty-free Sephora VIB minihaul vol. 2 | Beauty, for good. Pingback: Cruelty-free Empties: Vol. 5! | Beauty, for good.